Developer: Bandai, Nintendo Co., Ltd.
"Stadium Events is the English title of the Japanese Family Computer video game Running Stadium (ランニングスタジアム Ranningu Sutajiamu) by Bandai. The game was released for the Nintendo Entertainment System in Japan in 1986, in the United States in 1987 and in West Germany and Sweden in 1988. 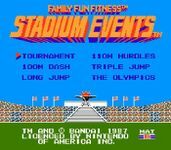 It was one of two games released in North America that were designed and branded for the Family Fun Fitness (FFF) mat as World Class Track Meet. The other game in the Family Trainer series, Athletic World, was released earlier in the same year. Athletic World's label is marked with a green "Series 1"; Stadium Events has an orange "Series 2" badge. This numbering system was abandoned when Nintendo took over further Bandai releases for use with its Power Pad instead. Although there were 10 total games in the Family Trainer series, only these two games were released in North America under the Family Fun Fitness banner. The original box for the FFF mat features screenshots of Stadium Events under the banner "Coming Soon." The game featured an Olympic-style Track and Field competition, with events such as the 100m dash, 110m hurdles, long jump, and triple jump. Modes of play include "Tournament" and "The Olympics". Race opponents are named after animals, the slowest being Turtle and the fastest being Cheetah. Players utilized the Family Fun Fitness mat (Side B) instead of a standard controller in order to run and jump. A controller, connected to Port A, is used to navigate the game's menu. The North American, or NTSC, version of Stadium Events is universally accepted as the rarest licensed NES game available for purchase in North America. It was recently named #6 on a list of 20 "Holy Grails of Console Gaming", a list that covered all gaming systems in all countries. The reason for its rarity and subsequent high market price is due to its limited production and sales. At the time of its launch during the holiday season of 1987, Stadium Events was only available in limited stores. In 1988, Nintendo purchased the North American rights to the FFF mat technology and re-released it as the Power Pad. The two Family Fun Fitness-branded games that had already been released, as well as Bandai's version of the running pad accessory, were pulled from shelves and presumed destroyed. Because of this odd sequence of events, only 2000 copies are believed to have been produced, of which it is estimated that 200 copies reached consumers before being recalled. Today, collectors who follow the online sale of rare video games believe that fewer than 20 complete copies of the game exist, only two of which are known to be factory sealed. An eBay auction of a NES console along with a copy of the game with manual and box landed the seller a winning bid of $13,105 on February 13, 2010. Another eBay auction on a new, factory-sealed version of the game was sold on February 26, 2010 with a winning bid of $41,300, nearly double the old record. There is currently another copy of the game in near mint condition with accompanying manuals, boxes and flyer that is at $800,200 bidding price, almost twenty-times the previous mark. However, after the auction was ended, it was discovered that the 2 top "buyers" were simply increasing the price for a joke. Since then the seller has relisted the item. The European version of Stadium Events is not as rare as its American counterpart, but is still an expensive NES game. The PAL version was released in multiple languages so some versions have English wording, while others have German or even Dutch. The game isn't as rare because Nintendo never recalled it like they did with the NTSC version. The value of this game varies depending on the condition of the game, and supply and demand. Prices have been anywhere from $200 (cart only, decent shape, average demand) to $4,000 (NEW in box, high demand). Both of the games available in the US for the Family Fun Fitness mat were retooled and relabeled to reflect compatibility with the Power Pad instead. Athletic World's label and manual were changed slightly, replacing Family Fun Fitness verbiage with Power Pad wording. The box for Athletic World was changed completely, making the original box and manual a collector's item. A complete copy of the original Bandai Athletic World game rarely surfaces. Some collectors believe there are less than 500 complete copies of the game. Stadium Events, however, was not similarly modified and re-released, but was instead recalled and distributed under an entirely different title, World Class Track Meet, in late 1988. The games are identical in gameplay and content, except for title changes within the game to reflect the new name. The re-release, World Class Track Meet was produced and sold in large numbers, as it was a pack-in game for Nintendo's Power Set bundle, which included (among other items) the NES console, Power Pad, and World Class Track Meet. The Family Computer version of Running Stadium was not recalled or otherwise limited, and survives in greater numbers than the North American version. The Family Fun Fitness pad with the Athletic World pack-in saw a PAL-B release in the Benelux region, Scandinavian region, France, West Germany, Austria, and Switzerland, as well as a PAL-A release in Italy and Australia. Furthermore, the title of the pad was altered to Fitness Center in West Germany, Austria, and Switzerland. There was no official release outside of these countries. Stadium Events was never released in PAL-A format and seems to have only had a small PAL-B release in both West Germany and Sweden. The German and Swedish PAL-B releases, while sharing the same software, varied slightly in packaging. While the box for both releases is identical, each region received a unique manual and cartridge back-label. The German release can be identified by its FRG-coded blue manual and DAS code on the cartridge back-label, whereas the Swedish release can be identified by its SCN-coded yellow manual and SCN code on the cartridge back-label." Source: Wikipedia, Stadium Events , available under the CC-BY-SA License.